Agile is an iterative project management methodology. Agile approach is based on frequent releases of working product and incorporating customer feedback throughout the development. Agile goes hand-in-hand with DevOps. 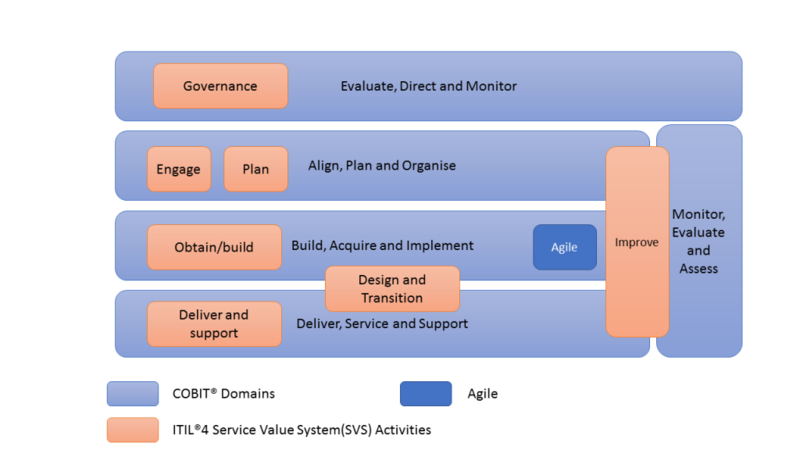 Agile development is considered as part of ITIL 4 and “Build Acquire and Implement” domain of COBIT. It is possible to introduce Agile for some specific type of projects. For example, an organisation may have traditional waterfall approach (like PMBOK or Prince2) for legacy applications development and Agile for digital development projects. The organisations implementing Agile need to understand core principles or “manifesto” 1. There are different interpretations and approaches to implement Agile. One of popular implementation of Agile is through SCRUM methodology. Stand-up: The team and customer get together on a daily basis or weekly basis (or anything in between) typically for 15 minutes status update. The stand-up meetings replace the formal Project Meetings. Sprint demo: The team will demonstrate the working product that is shipped in the iteration. Sprint retrospective: A reflection on what went right and wrong in the previous sprint. SFIA skill Project Management includes both predictive project management (water-fall approach) and adaptive approaches like Agile.